The sky is black with ash-fall. People are standing in the streets, looking up into the fog. They hold out their hands, and little mounds of grainy black stone gather. Down the clay-walled guinnels of the town you hear the cathedral bells ringing a discordant pattern, as though God himself is beating the life out of them. The ground jumps and growls underfoot. You look around, into the faces of your neighbors, and wonder what sin you have committed to deserve this. Then you see the first of the slow-rolling waves of lava, inching their way down the mountainsides towards you. 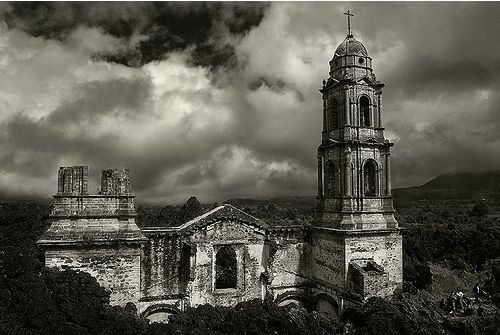 In 1943 the earth gobbled up the little Mexican towns of San Juan Parangaricutiro and San Salvador Paricutin. It began with dense ash-fall, deep tremors, and a slow tide of magma that progressed at three meters an hour. 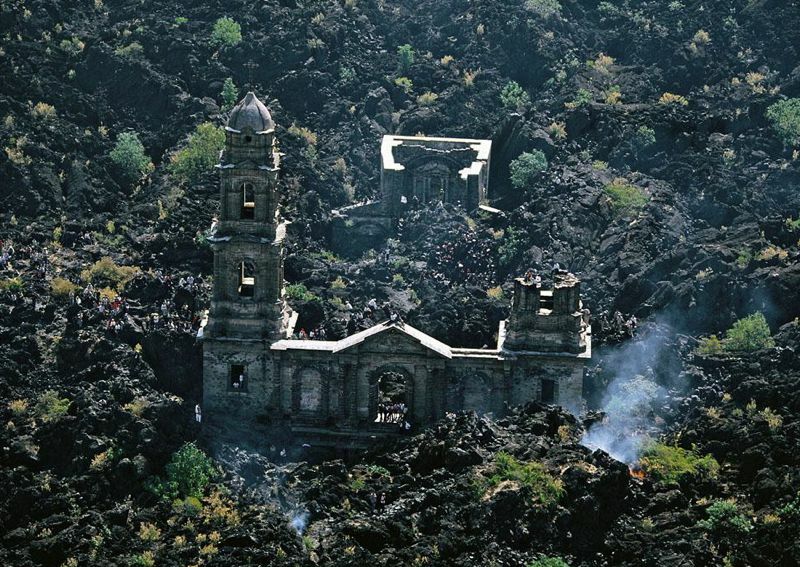 It ended a year later with the town engulfed, the buildings overwhelmed, and only the towers of the Paricutin cathedral looming above the crystallized lava. 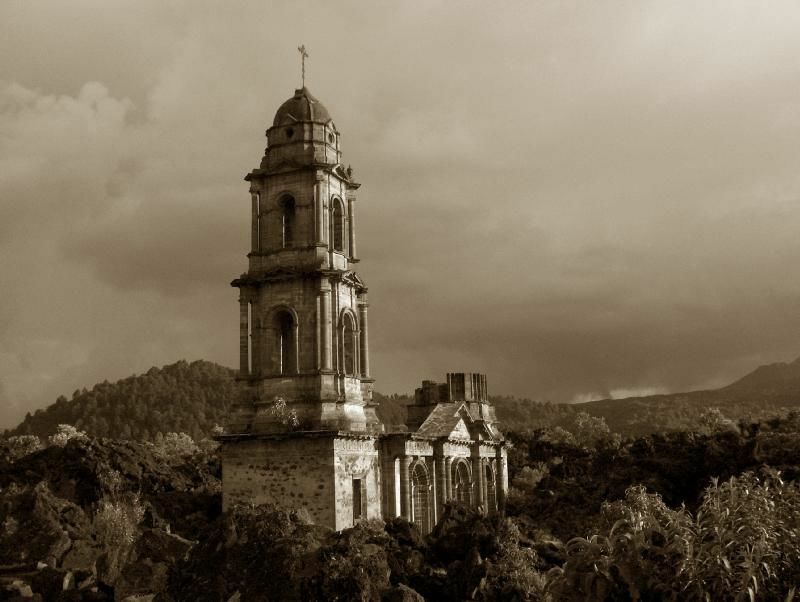 Nowadays it’s a popular tourist site, with the church still occasionally used for religious festivals and rites. 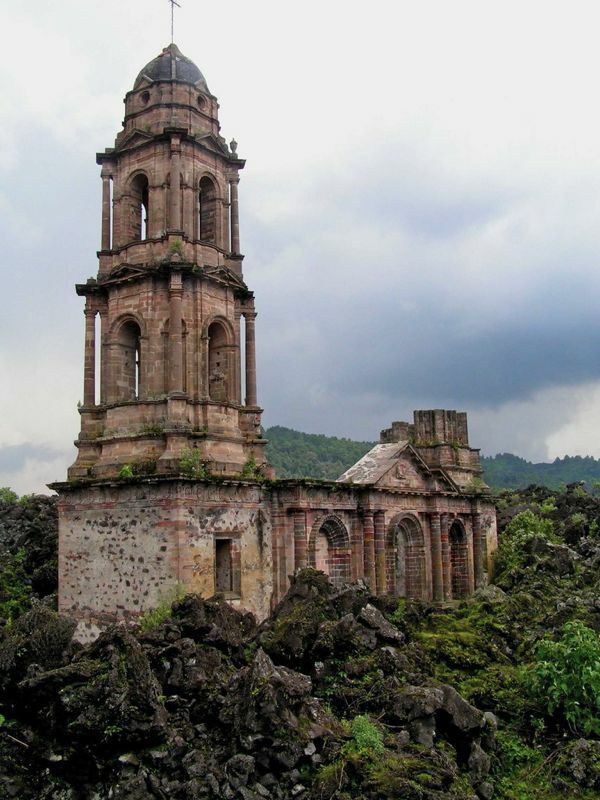 The Paricutin volcano, formed in the eruption of 1943, finished its slow tantrum after eight years and has lain relatively dormant since. It stands 1,345 feet above the devastation it spewed out. 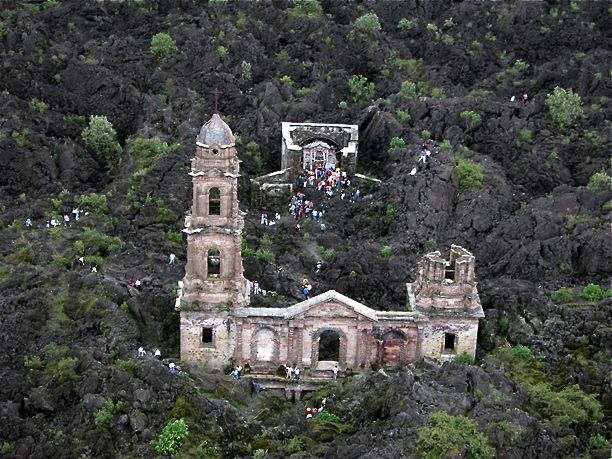 Tourists throng to the rear chapel, where an image of El Señor de los Milagros, The Lord of the Miracles, is enshrined, surrounded by candles and flowers. 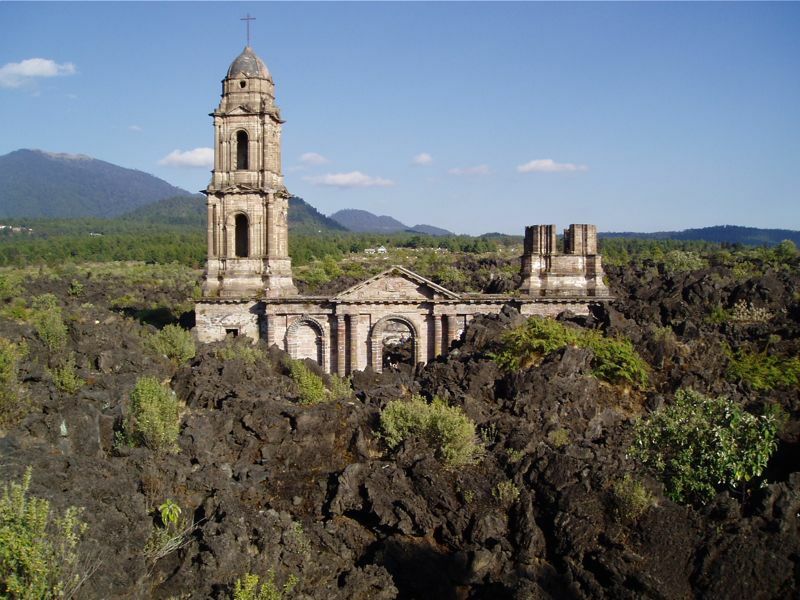 The volcanic rock remains largely bare, with little sustenance for nature to take hold of. 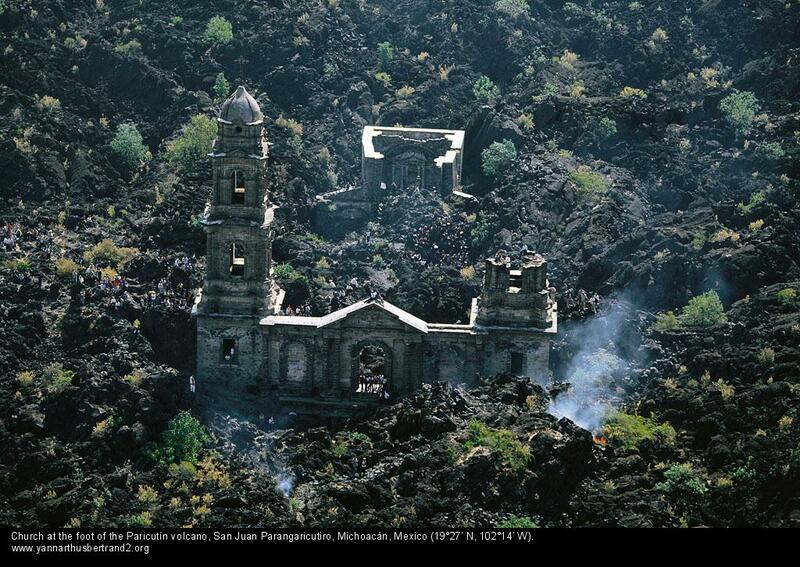 The lava wave and cathedral embraced. A cross remains, unbowed, atop the sole remaining tower. This place appeals to me with the same kind of pull as Pompeii. 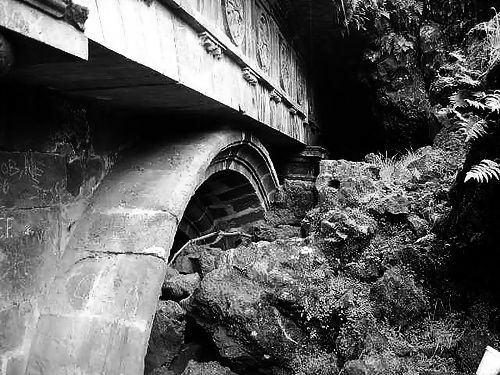 Ir probably borrows some of the gravitas from Pompeii, in fact, because this ruin itself is only 60-odd years old. The buildings buried beneath the rubble, or their remnants, would not be that unusual were we to see them. But because this church, already itself ancient, is all we can see, it lets our imagination run riot about what else might be under there. Imagine an entire ancient city, buried in rock, just waiting to be discovered and explored. 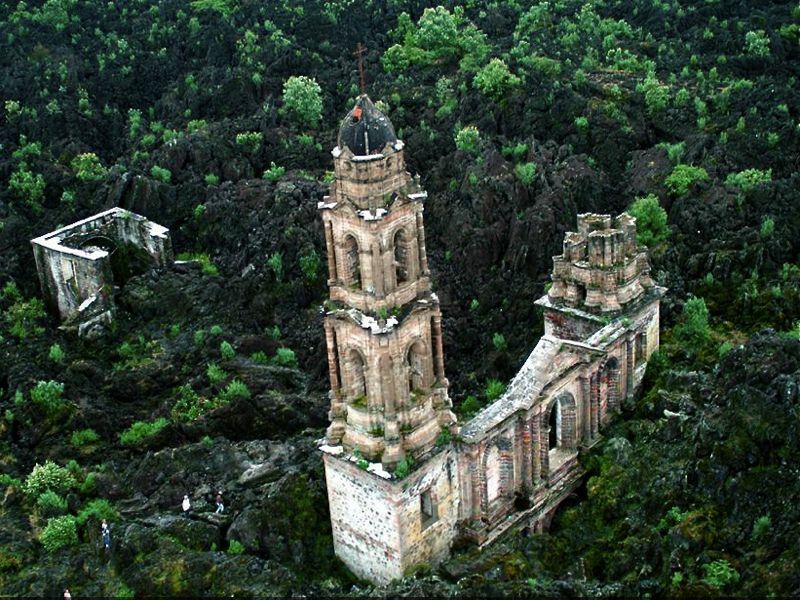 This is one awesome (in the sense of both awe-inspiring and aweful) ruin. Thanks for posting.